This ticket allows access to Bicton Gardens, please print out or have your emailed order available as proof of your ticket purchase. If you have chosen to upgrade to annual membership your card will be provided at the reception by one of our staff on arrival. Upgrade’s also give you access to Morwellham Quay. We also offer 5% discount to all member card holders for purchases in the gift shop and restaurant. 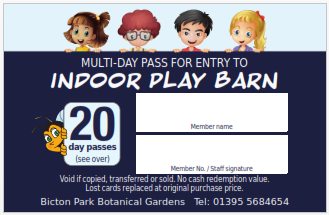 For an extra £9 per person you can upgrade your daily ticket to a 12 month membership which includes free entry for a whole year to Bicton Park Botanical Gardens and Morwellham Quay, discounts in both our restaurants and gift shops and children (2-11 years) also receive a 20 entry pass to our Indoor Play Barn worth £15.00. Day Tickets includes a FREE day ticket to our soft pay area for children. Children 2 to 17 years £9.95 Ordered online £8.95 Children must have one adult to accompany them. Mini golf £1.00 (Per person) - £5.00 refundable deposit required for equipment hire. NOTE: Tesco vouchers may not be used in conjunction with memberships.